This year is the 25th anniversary of the Vienna Declaration and Programme of Action, which states that “special emphasis” must be put on to measures that aim to reinforce a “pluralistic civil society”. On this occasion, International-lawyers.org and Geneva International Centre for Justice want to express their concerns over the continuous reduction of civil society space at the Human Rights Council. 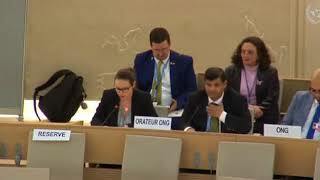 Civil societies from developing countries are facing difficulties in the process of registration and accreditation for the Human Rights Council sessions. In fact, they can be confronted with internet-related technical complications. Furthermore, the accreditation system is not available in all UN languages. It is of great importance that civil societies, especially from developing countries have equal opportunities to participate in this Council and do not face any discrimination due to technical barriers. We would equally like to point out our concerns regarding the functioning of the oral statement registration system and we recommend that a more transparent process should applied. We also want to take this occasion to draw attention to the fact that the African Working Group meeting is scheduled during the last week of this session, despite some countries asked via “note verbale” for the re-scheduling of the meeting. This overlap will cause the impossibility for important contributors to participate in both events. It is important, in order to have more progress, to enhance the cooperation and the organization between the different bodies.